It’s a well trodden path now, this one that begins with a street food stall and ends in bricks and mortar. That it’s no longer an unusual route, though, does not mean it’s not a difficult one — difficult to operate on the streets (or, more likely, in a yard), difficult to raise funds, difficult to find the right space, and difficult to get it right when under your own roof. There’s no less effort involved than a more conventional restaurant opening. You can tell pretty quickly the ones aiming and able to move indoors; and within that grouping, the ones who will do it well. Media-savvy and slick from the start, ambition and intention is easy to spot. But the businesses that are actually good have something else too. In part it’s their product. Obviously it’s got to pack a punch, but it must also be transferable to a restaurant situation. Mostly, though, it’s about the founders. They need to be the face of their food — across every aspect and more than willing to get their hands dirty, whilst at the same time able to run a business, delegating and trusting as required. From Meatliquor through Pitt Cue, Pizza Pilgrims, Bao and Bleecker St, the best have founders that both drive and graft. It was obvious from the moment it appeared at Street Feast, that Smokestak had both the intent and the personnel to move from street food to grown-up restaurant. In fact, from day one Smokestak took UK street food to another, more professional level; what with its massive, cast-iron smoker (more like a Victorian locomotive than a barbecue), and massive, black t-shirted, black gloved, Barbudian founder, David Carter, hulking massive slabs of brisket, beef and pork ribs from smoker to grill to chopping board to customer. There was clearly cash behind the project, but nous, integrity, and great food too. Roll forward what, two (three?) summers and Smokestak have finally got a roof. More specifically, they’ve a whole load of expensive Shoreditch apartments enjoying the waft of hickory smoke through the day and night. The Carbuncle Cup nominated Avant Garde Tower gets even less desirable. Bad news for the residents, perhaps, but good for the rest of us. Continuing the look that’s always been present, this restaurant is all Steampunk cast iron and chunky railway sleepers. There’s still brown paper under the meat, but matt black plates and black cutlery too. A distinct good-time beat pulses through the room in the evening (loud), though it’s pleasingly serene at lunch. Most significantly, although the menu is simple (you’re here for barbecue), it’s written so that you can make a meal of it. From the top: sweet, crisp, juicy, succulent but nobbly nuggets of pig tail make for one of the best snacks of 2016. Slow-cooked then blasted tail will surprise all but the most devoted disciples of St John with their moreishness, admittedly aided by a sweet glaze. Order a bowl of these and a beer before you sit down. There are a few other nibbles too, including cured jowl on brioche too (ethereal bacon on toast, effectively), which was decent but paled in comparison to the tail. Then it’s on to a kind of starter section. Coal roast beetroot looks good, but I’ve not had it yet. We were drawn, instead, to girolles on toast. Our portion was plentiful, but the mushrooms were smothered and overwhelmed by a heavily reduced sauce, which I felt was a big shame (subsequent pictures I’ve seen suggest this is now more like the shrooms on dripping toast I expected). 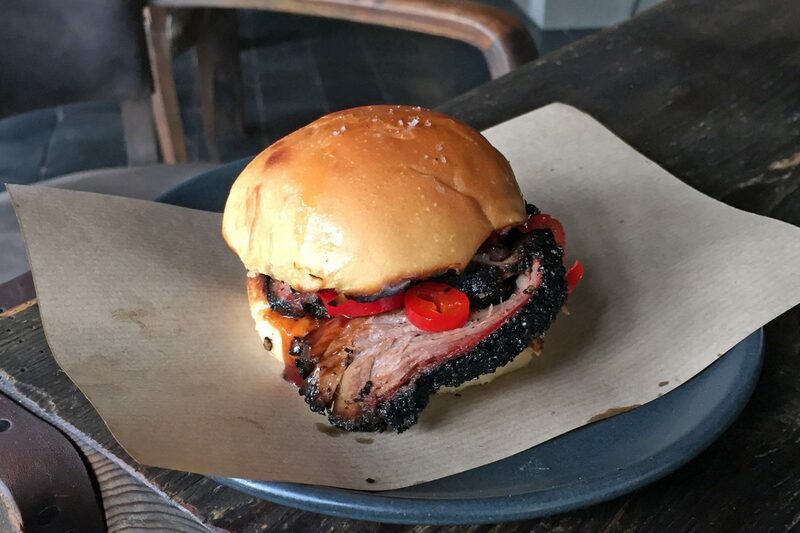 So at lunch a few days later I began again, this time with the house brisket bun with pickled red chilli. The bread suited its role to a T — soft and yielding but with enough structural integrity to last the whole eating process; the pickles were sharp and added a fruity heat; and, most importantly, the brisket was unctuous but needed to be chewed, was smokey and sweet, yet still fundamentally tasted like beef. As with the pig’s tail, put an asterix next to this. After that we’re into ‘mains’. Four to choose from: more brisket and pickled chilli, but no bread this time (I have to say this dish on my first visit was a little dry for my preference); brilliant pork ribs, all sticky and sweet, smoked slowly but also charred over hot coals to finish, with pickled cucumbers to cut through the richness; a cured and hot smoked salmon option; and probably my favourite thing on the menu, a beef rib, which was tender, wobbly, deeply satisfying and definitively bovine. The meat is deceptively, if not unpredictably rich. Indeed, I wouldn’t be surprised if many people look disappointedly at the portions as they arrive … only to find that by the end of the eating they’re as full and sated as can be. That belly filling and happiness is helped, I think, by two must order side dishes: first, a hibernation-preparing jacket potato shell filled with creme fraiche, mashed potato, and a bit more creme fraiche for good luck, then covered with cheese and burnished until molten; and a necessary and very enjoyable slaw of celery, fennel, white cabbage, almonds and a sprinkle of caraway. Crunchy, fresh and revitalising. Bottom line. Worry not, you will definitely be stuffed the end of your savouries. Though do stick around and order the sticky toffee pudding to finish. With the lightest of sponges, and brown butter enriched caramel, Smokestak’s is one of the very best of its kind. Entirely unnecessary, but a very happy ending. Share it with another, if you must. I’ve not been to Texas, Kansas, or Carolina, so wouldn’t presume to know what is and is not ‘authentic BBQ’. Interestingly, Carter is keen to stress that he’s not trying to ape, but interpret. So his huge, extraordinary smoker that takes about a fifth of the restaurant space is as American as they come. Ditto the USDA meats and smoking process. But finishing pork ribs on the grill is not, nor are the sides, the format of the meal, those matt black plates, or the bustling, near night club like set-up. For me it’s a smart approach. You can’t replicate a Sunday spent tailgating outside a college football ground, or an outdoor BBQ in Austin, with its cheap white bread, plentiful corn and utilitarian trays. David’s version is highly considered and very deliberate, but for a guy with a Roka and Claridges background, this form of hospitality is what he knows, and what he knows how to do well. It’s authentic to him. 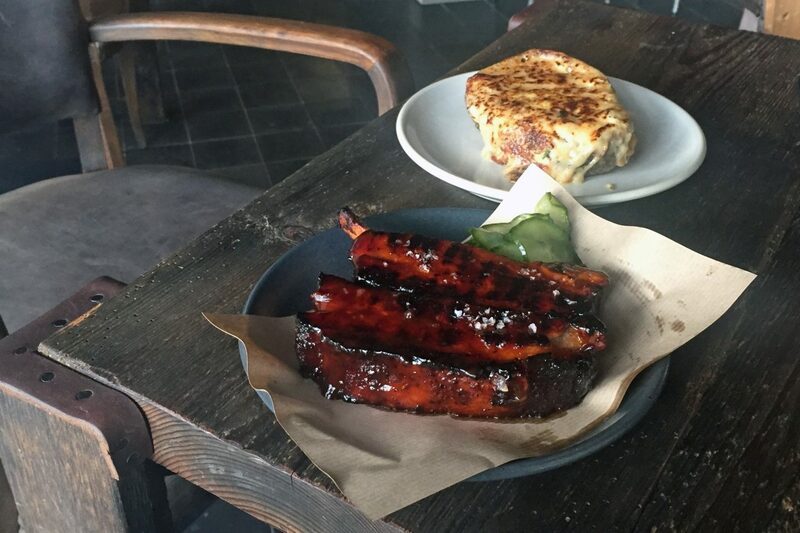 A restaurant has always been the plan for Smokestak; no doubt the street food part of it was always proof of concept, rather than aimless punt. But it’s been a slog to get to where they it is and I wish them well. That said, I do hope the outdoor operation continues — whether at a Streetfeast location, festival or elsewhere — as I personally prefer to eat this kind of food with my fingers, perched outside on a cheap seat, wall or pavement. Meanwhile, as far as indoor BBQ in London goes this is right up there, maybe even topping, the very best of them. (See also Shotgun and Hot Box). Expect to spend £25-35 per person on food. Booze is your call. Disclosure: I ate once as a guest of the restaurant, and another time as a paying customer.